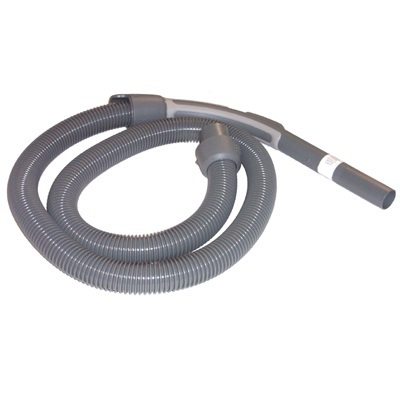 This genuine EL6985A Electrolux Harmony vacuum hose is a flexible, swivel hose with an ergonomic, curved tubular handle. Aside from being elegantly curved and comfortable, the handle also features a suction control mechanism that allows you to fine tune the vacuum's suction power and find appropriate settings for various floor surfaces. Please be sure you have a compatible vacuum model before placing an order. Its way too early to evaluate the performance of this hose - I just got it. I will say that it is composed of different material than the one that came with the vacuum. It fits perfectly and functions properly so now it only remains to be seen if it holds up. The last hose I had went for 5 years.before it broke. Our cleaning staff put this equipment through a rugged set of disciplines so we will see how it holds up. Product was delivered quickly and looked like an exact replacement. So I purchased this hose in May of 2016. I do not believe it's a genuine Electrolux hose because by October it had cracked almost in half. I duct taped it in the area but other areas continued to crack and separate. It's cheaper to buy a new vacuum than having to replace the same part that keeps breaking every few months. I received my vacuum hose in a timely manner. It works great! Answer:Yes this is the correct hose for that model vacuum. Answer:This hose will fit Electrolux model EL6986.